Having oily skin can be difficult especially if you are a makeup lover. All you want is for your perfectly applied foundation and face makeup to not melt off and not look like a greased-up mess at the end of the day. Dewy foundation or any foundation with “glow” in its name and description is usually a no-no and something that my oily skin people tend to stay away from. Those types of skin makeup usually get melted off by the natural oils in your face and you just end up very shiny, patchy, and basically, a hot mess by the end of the day. That cute, glowy, dewy look turns into greasy, oily, and not cute very fast. This is where matte foundation comes in. Matte foundation is basically a girl with an oily face’s savior. You don’t really need to add glow or dewiness on your face when you have oily skin, what you need is makeup that will help keep your natural oils at bay and your face non-greasy. A great matte foundation will control the oil that your face produces, keep you matte for longer, and stay on until you want to take it off. Another concern for oily skin is that usually, what comes with that is acne prone skin. Oil based foundations have often been found to worsen or be the cause of breakouts for those who have oily skin. Your skin is already producing a lot of oil, adding more to it by using an oil based foundation will cause your pores to be blocked and for the dirt and makeup particles to be trapped in them therefore causing the blemishes to pop up. So, what is the solution for all of this? Four words will get your skin a ton of relief and still give you that dose of makeup that you need in your life: oil free matte foundation. A non-oil based foundation won’t pack on oil on your face and clog your pores, this will significantly reduce the chances of your skin breaking out. A matte foundation will take care of the shininess that might occur with the natural oils that your face produces and of course, will still give you that coverage that you need. Here are the best oil-free matte foundations that your skin will thank you for. 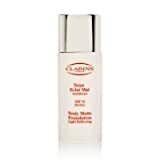 The Clarins Truly Matte Foundation is perfect for those who want a very natural-looking matte foundation. The finish of this is super pretty, subtle and matte but not flat. Often times, matte foundation can look and feel heavy on the face or emphasize any dry of flaky patches and make the skin look dull. This foundation provides a super velvety matte finish but still achieves quite a healthy glow. It doesn’t cling onto any dry patches and it feels very lightweight. You can wear this as a light coverage foundation by using just a tiny amount of it and get that matte but natural, skin-like finish or you can build it up to cover up more of your discoloration and blemishes by packing on a bit more product. This foundation is a liquid foundation with a runny consistency and is, of course, oil-free so it has less chance of causing any breakouts or clogging your pores. The Bare Minerals Matte Foundation, if we’re being honest, is probably the best foundation you can actually use if you want to really take care of your skin. Dermatologists all over the world always suggest switching on over to mineral based skin makeup if you have really oily and acne prone skin. And the best mineral based matte foundation out in the market right now is the Bare Minerals Matte Foundation. Most of the time, a lot of makeup lovers are hesitant to make the switch to mineral foundation because quite frankly, they’re just usually not as good as their non-mineral based counterparts. However, Bare Minerals have definitely delivered with their products and are the reason more and more people are going the mineral route. The Bare Minerals Matte Foundation provides sheer to medium to full coverage depending on how you build it up. Unlike a lot of other mineral or powder based foundations, it’s not cakey, chalky, or drying. As you apply the powder on your face, it melts and blends perfectly on the skin. It doesn’t have a completely flat matte finish, in fact, it still gives your face a nice and healthy natural glow while still controlling and helping absorb the natural oils on your face. This product is, of course, completely paraben and oil free along with other synthetic ingredients usually found in foundation that could agitate very sensitive skin. It has natural ingredients and is advertised as “makeup you could sleep in” so it’s definitely safe for sensitive skin. I know what you’re thinking, how did a “luminous” foundation make its way onto this oil free matte foundation list? Admittedly, NARS’ name for this product is a bit misleading because even though the NARS All Day Luminous Weightless Foundation has “luminous” in it, it actually has a fairly matte finish. This definitely has great full coverage that will give you that perfect, flawless effect. This will cover redness, blemishes, and any kind of discoloration you want to conceal to have a perfectly even and smooth complexion. If you follow any makeup artists or beauty gurus online, then you will have probably seen these being raved about by a few of them and for good reason! This doesn’t only look really nice on the skin and gives you amazing coverage, it also lasts amazingly well so you won’t look super shiny only after a few hours. It is, of course, oil free so even if you do make the most out of its staying power and keep it on all day, it won’t clog up your pores too badly. If you are updated on all things makeup and love watching your favorite beauty bloggers rave about the products that they have been loving lately, then you will definitely know that the Rimmel Stay Matte Powder is practically everywhere and every beauty lover adores this product. 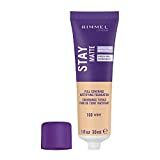 Rimmel have also actually come out with a range of products in the “Stay Matte” line and one of them is the Rimmel Stay Matte Foundation. If you’re already familiar with the Stay Matte Powder, you’ll know that makeup gurus absolutely love it because it does such a great job of mattifying and keeping the skin matte throughout the day. You can expect the same thing for the Rimmel Stay Matte Foundation. If you’re one of those people who really love that super matte effect with no shine at all, then this foundation is definitely for you. It’s not a liquid but rather, a mousse foundation so a little goes a very long way. The coverage of this is definitely medium to full so your discoloration, blemishes, and redness will be completely covered and you’ll get a super matte, flawless finish. The lasting power of this is amazing and you’ll definitely “stay matte” for a long time. You don’t have to worry about your skin being suffocated too much either because this foundation is oil free and lightweight. When it comes to oily skin, especially in the summer or humidity, matte foundation is going to be your best friend. It will help control the oil your skin produces and last longer throughout the day. Basically, it will keep that dreaded sheen of grease from covering your face completely. However, something you may not know is that a lot of matte foundations still actually have oil in them. Yes, even though you might use a “mattifying” foundation, you might look at the ingredients and find that it still contains oil or is oil based. This is because oil is usually what is used in most foundations to act as a base and basically make all the different ingredients mixed together into a makeup product. The bad thing about it, though, is that it isn’t really good for your skin. If you have oily skin, oil based foundations can clog your pores and cause breakouts. If you find that you have had a lot breakouts and your skin has been really bad lately, then it might be time to change your foundation. Luckily, there are now some amazing matte foundations that are completely oil free but acts just as well as their oil based counterparts. If you have super sensitive and oily skin, then it’s better in the long run if you switch to a foundation that is oil free. Your skin will be able to breathe, you’ll get less breakouts, therefore, makeup will look even better on your skin! If you’re scared that oil free matte foundations might not be as good as oil based ones, don’t be! This list contains the best oil free foundations right now that are totally worth converting for. Matte Foundation Definition: Is It Right For You?